(1) S'rî S'uka said: 'Asking such very good questions you are a most fortunate soul, oh best of the devotees, because you with your wish to hear the stories about the Lord again and again, lend them new charm. (2) This is what sets apart the truthful ones who accepted the essence of life: that what is their life's purpose, the aim of their understanding and what comes first to their mind, appears to be new every time they properly discuss matters in relation to the Infallible One, despite the repetition, just like every woman seems to be new to a womanizer. (3) Please listen carefully, oh King, I will relate it to you... even though it is a confidential subject. For gurus describe even hidden matters to a loving disciple. (4) After He had saved the boys and calves from the mouth of that deadly Agha, the Supreme Lord brought them to the river bank and spoke the following words: (5) 'Oh, how beautiful this river bank is My dear friends! It offers all opportunity to play, with its soft and clean sands, the aroma of the blooming lotuses that attract the bumblebees and the sounds of the chirping birds everywhere in the many trees! (6) Let us eat here. It is late now and we are weak from hunger. After the calves drank from the water, they at ease can eat from the nearby grasses.' (7) They consented, let the calves drink from the water and took them to the tender grasses. Then they opened their lunch bags and happily enjoyed their meal together with the Supreme Lord. (8) In a wide circle happily facing inward, the boys of Vraja grouped in rows around Krishna. Thus sitting down in the forest they looked as beautiful as the petals and leaves that make up the whorl of a lotus flower. (9) Some of them used flower petals as a plate while others used bunches of leaves, twigs, fruits, [the material of] their packets, the bark of trees or a slab of rock. (10) All of them allowed the others a taste of their own favorite food and thus they with the Lord had a good time taking their lunch while laughing and making others laugh. (11) With His flute tucked away in His belt and with the horn and the prod at His left side, He took the yogurt rice and pieces of fruit between His fingers. Keeping Himself in the middle of the circle of His comrades He made them laugh telling His jokes. The denizens of heaven thus witnessed how the Enjoyer of all Sacrifices was enjoying His childhood pastimes. (12) Oh scion of Bharata, while the Infallible One this way in harmony was eating together with the cowherds, the calves looking for grass had wandered deep into the forest. (13) Noticing that, Krishna, the Terror of Fear, said to the worried boys: 'Oh friends, stay where you are, I will bring the calves back to this spot!' (14) Krishna, the Supreme Lord, after saying this, went away with a bit of food in His hand to look everywhere in the mountains, the caves, the bushes and the bowers for the calves of His friends. (15) He who was born from the lotus and who resides in the beyond [Lord Brahmâ], was very charmed by the way the Lord had enchanted the boys. Just to see more of it he led the boys and their calves away to hide them elsewhere, oh man of the Kuru bond. This authority from heaven who before had witnessed the deliverance of Aghâsura, had become very astonished about the Almighty Personality [see footnote*]. (16) When Krishna nowhere could find the calves nor the cowherd boys after He had returned to the river bank, He searched the entire forest for the both of them. (17) Neither finding the calves nor their caretakers anywhere in the forest, Krishna, well aware of everything going on in the universe, understood immediately that this was the work of Vidhi [Lord Brahmâ]. (18) In order to please the mothers of the boys and also him [Brahmâ], Krishna, the Controller managing the entire universe, thereupon expanded Himself to both the forms [of cowherd boy and calf]. (19) With a perfect likeness of the cowherd boys and their tender calves, having the same size of legs and hands and the same bugles, flutes, sticks and bags and such; with the same ornaments and dresses in all respects, with exactly their character, habits, features, attributes and traits and playing the same games and such, Krishna, the Unborn One, manifested Himself in expansions of Vishnu with the same voices and bodies they had. (20) Personally thus in different ways enjoying the company that He offered Himself in the form of the calves and the cowherd boys, He, the Soul of All, thereupon entered Vraja. (21) He brought Himself in the form of the different calves to the different cowsheds and next entered the different houses with the different persons He had become, oh King. (22) As soon as their mothers heard the sound of their flutes, they immediately abandoned what they were doing and lifted them as feathers up in their arms. They hugged them and allowed them, being wet from their love, to drink from their nectarean breast milk. In that spirit feeding their sons [they were thus of respect for] the Supreme Divinity [the Supreme Lord]. (23) Every time Mâdhava thereupon in the evening came home, oh ruler of man, having finished what He had to do, they happily took care of Him with their actions of massaging, bathing, smearing and decorating Him, chanting mantras for His protection, marking Him with tilaka and sumptuously feeding [all the boys He was]. (24) Thereafter the cows, that had arrived in their sheds, immediately loudly mooing called for their calves. These followed them, were time and again licked by them and fed with the milk that flowed from their udders. (25) From cow and gopî there was in this matter the motherly affection as there was before, be it that since this love now was derived from the Lord [in the form of the calves and boys], it was free from the bewilderment of 'this is my child' [free from 'I' and 'mine']. (26) Now that the children of the inhabitants of Vraja, unlike before, were all like Krishna for the time of a year, the creeper of affection for them [and Him] gradually, day by day, increased without a limit. (27) Thus for the period of a year tending Himself in the form of the calves by means of Himself in the form of the cowherd boys, He, the Supersoul, wished to play His game [His lîlâ] in the community and the forest. (28) One day, five or six days before a whole year had passed, the Unborn Lord, together with Balarâma taking care of the calves, entered the forest. (29) In the vicinity of Vraja looking for grass for their calves, they at a distance were spotted by the mother cows that were pasturing on top of Govardhana hill. (30) As soon as they saw them they, urged by their love, forgot about the herd. Despite the difficult path, they broke away from their caretakers and loudly mooing galloped fast [downhill] with their necks raised to their humps, their heads and tails upwards and dripping milk from their udders. (31) The cows united with their calves at the foot of the hill and, despite having calved again, fed them with their flow of milk and anxiously licked their limbs as if they wanted to swallow them. (32) The gopas being frustrated in their efforts to keep them from the difficult and dangerous path, felt greatly ashamed for having gotten angry with them, for when they got there, they found their sons together with the cows and calves. (33) Their minds were steeped in a mood of utter, transcendental love and with that great attraction their anger melted away like snow before the sun. Lifting their boys up in their arms to embrace them, they smelled their heads and experienced the highest pleasure. (34) Thereafter the elderly gopas, overjoyed with the embraces, could only with difficulty tear themselves loose from them and had tears in their eyes upon the memory. (35) When Balarâma saw the abundance of love and the constant attachment of all the inhabitants of Vraja, however long ago their children and the calves had left behind their mother's breast, He could not understand the reason for this and wondered: (36) 'What kind of miracle is happening here? The divine love [prema] of Me and everyone here in Vraja for the children and for Vâsudeva, the Soul of the Complete Whole, has never been so big! (37) Who would be behind all this? What has caused it? Is it a divine being, is it a woman or a she-devil? In any case it must be the special grace [Mâyâ-devî] of My Sustainer. Who else could bewilder Me like this?' (38) Pondering thus He through His mind's eye saw that all the calves along with their companions were [manifestations of] the Lord of Vaikunthha. (39) [Balarâma said to Krishna:] 'These boys are no [incarnated] masters of enlightenment, nor are these calves great sages. You, oh Supreme Controller, only You are the One who manifests Himself in all the diversity of existence. How can You be everything that exists at the same time? Tell Me, what exactly is Your word to this?' By saying these words Baladeva then with His Lordship arrived at an understanding of the situation [**]. (40) The selfborn one [Brahmâ] returning after such a long time, saw that, even though it was but a moment later to his own notion [see kalpa], one year later the Lord was playing together with His expansions like He did before. (41) [He said to himself:] 'Because the many boys in Gokula together with their calves, fast asleep are situated on the bed of my deluding power, it cannot be so that they today would have risen again. (42) I therefore wonder where these boys here came from. They are different from the ones bewildered by my power of illusion. Yet the same number of them is for an entire year playing together with Vishnu!' (43) For a long time thus contemplating what the difference between the two would be, he, the selfborn one, by no means could determine who of them were the real ones and who not. (44) And thus even he, the unseen one, was factually bewildered by his own mystic power, he who wanted to mystify Vishnu, the One who Himself being eleveated above all misconception, mystifies the entire universe. (45) As meaningless as the obscurity of a fog is during the night and the light of a glowworm is during the day, a person of a lesser mystic potency will realize nothing but his own destruction when he tries to use this power against a great personality. (46) And even as the selfborn one was looking on, he saw the herders of the calves appearing with the complexion of a rain cloud and in clothes of yellow silk. (47-48) They had four arms and held a conch, a disc, a club and a lotus in Their hands. They wore helmets, earrings, necklaces and garlands of forest flowers. They were marked with the s'rîvatsa, carried the [Kaustubha] jewel about Their conch-striped necks and had bracelets around Their wrists. They had ornaments at Their feet and bangles on Their ankles. With Their belts around Their waists and Their rings around Their fingers They were most beautiful to behold. (49) From head to toe all Their limbs were covered by strings of fresh, soft tulsî [basil] that had been offered by those [devotees] who are of great merit [see also 10.12: 7-11]. (50) With Their smiles as bright as moonlight and the clear glances of Their reddish eyes, They, being just like [the natural modes of white] goodness and [reddish] passion, were the creators and protectors of the desires of Their devotees [compare 10.3: 20]. (51) The Praiseworthy Primal Being [of Vishnu thus] was by all beings moving and not moving, from the first being [of Brahmâ] down to the smallest clump of grass, worshiped in different ways, with [for instance] dance and song. (52) The glory of the perfections [siddhis, being like the smallest etc. ], the mystic potencies headed by Ajâ [***] and the twenty-four elements of creation headed by the complete of them [the mahat-tattva] were standing around Them [in a personal appearance]. (53) They were worshiped by the time factor [kâla], the individual nature [svabhâva], the reform by purification [samskâra], desire [kâma], fruitive action [karma], the modes [guna] and other powers the glory of whose appearances was defeated by His greatness [see also B.G. 13: 22]. (54) They were embodiments of the complete, one essence full of knowledge, bliss, truth and eternity. In Their glory They were of a greatness beyond the reach of even the seers of philosophy [see also 1.2: 12 and *4]. (55) The selfborn Brahmâ thus saw Them all instantly as expansions of the Supreme Absolute Truth [para-brahman] by whose effulgence this entire creation, moving or not moving, is manifested. (56) By Their radiance being caught in bliss and shaken in all his eleven senses, the selfborn one thereupon fell silent, just like the doll of a child [is nullified] by the presence of a locally worshiped deity. Third revised edition, loaded July 15, 2013. S'rî S'uka said: 'Asking such very good questions you are a most fortunate soul, oh best of the devotees, because you with your wish to hear the stories about the Lord again and again, lend them new charm. This is what sets apart the truthful ones who accepted the essence of life: that what is their life's purpose, the aim of their understanding and what comes first to their mind, appears to be new every time they properly discuss matters in relation to the Infallible One, despite the repetition, just like every woman seems to be new to a womanizer. Please listen carefully, oh King, I will relate it to you... even though it is a confidential subject. For gurus describe even hidden matters to a loving disciple. 'Oh, how beautiful this river bank is My dear friends! It offers all opportunity to play, with its soft and clean sands, the aroma of the blooming lotuses that attract the bumblebees and the sounds of the chirping birds everywhere in the many trees! They consented, let the calves drink from the water and took them to the tender grasses. Then they opened their lunch bags and happily enjoyed their meal together with the Supreme Lord. In a wide circle happily facing inward, the boys of Vraja grouped in rows around Krishna. Thus sitting down in the forest they looked as beautiful as the petals and leaves that make up the whorl of a lotus flower. Some of them used flower petals as a plate while others used bunches of leaves, twigs, fruits, [the material of] their packets, the bark of trees or a slab of rock. All of them allowed the others a taste of their own favorite food and thus they with the Lord had a good time taking their lunch while laughing and making others laugh. With His flute tucked away in His belt and with the horn and the prod at His left side, He took the yogurt rice and pieces of fruit between His fingers. Keeping Himself in the middle of the circle of His comrades He made them laugh telling His jokes. The denizens of heaven thus witnessed how the Enjoyer of all Sacrifices was enjoying His childhood pastimes. Oh scion of Bharata, while the Infallible One this way in harmony was eating together with the cowherds, the calves looking for grass had wandered deep into the forest. Krishna, the Supreme Lord, after saying this, went away with a bit of food in His hand to look everywhere in the mountains, the caves, the bushes and the bowers for the calves of His friends. He who was born from the lotus and who resides in the beyond [Lord Brahmâ], was very charmed by the way the Lord had enchanted the boys. Just to see more of it he led the boys and their calves away to hide them elsewhere, oh man of the Kuru bond. This authority from heaven who before had witnessed the deliverance of Aghâsura, had become very astonished about the Almighty Personality [see footnote*]. When Krishna nowhere could find the calves nor the cowherd boys after He had returned to the river bank, He searched the entire forest for the both of them. Neither finding the calves nor their caretakers anywhere in the forest, Krishna, well aware of everything going on in the universe, understood immediately that this was the work of Vidhi [Lord Brahmâ]. In order to please the mothers of the boys and also him [Brahmâ], Krishna, the Controller managing the entire universe, thereupon expanded Himself to both the forms [of cowherd boy and calf]. With a perfect likeness of the cowherd boys and their tender calves, having the same size of legs and hands and the same bugles, flutes, sticks and bags and such; with the same ornaments and dresses in all respects, with exactly their character, habits, features, attributes and traits and playing the same games and such, Krishna, the Unborn One, manifested Himself in expansions of Vishnu with the same voices and bodies they had. Personally thus in different ways enjoying the company that He offered Himself in the form of the calves and the cowherd boys, He, the Soul of All, thereupon entered Vraja. He brought Himself in the form of the different calves to the different cowsheds and next entered the different houses with the different persons He had become, oh King. As soon as their mothers heard the sound of their flutes, they immediately abandoned what they were doing and lifted them as feathers up in their arms. They hugged them and allowed them, being wet from their love, to drink from their nectarean breast milk. In that spirit feeding their sons [they were thus of respect for] the Supreme Divinity [the Supreme Lord]. Every time Mâdhava thereupon in the evening came home oh ruler of man, having finished what He had to do, they happily took care of Him with their actions of massaging, bathing, smearing and decorating Him, chanting mantras for His protection, marking Him with tilaka and sumptuously feeding [all the boys He was]. Thereafter the cows, that had arrived in their sheds, immediately loudly mooing called for their calves. These followed them, were time and again licked by them and fed with the milk that flowed from their udders. From cow and gopî there was in this matter the motherly affection as there was before, be it that since this love now was derived from the Lord [in the form of the calves and boys], it was free from the bewilderment of 'this is my child' [free from 'I' and 'mine']. Now that the children of the inhabitants of Vraja, unlike before, were all like Krishna for the time of a year, the creeper of affection for them [and Him] gradually, day by day, increased without a limit. Thus for the period of a year tending Himself in the form of the calves by means of Himself in the form of the cowherd boys, He, the Supersoul, wished to play His game [His lîlâ] in the community and the forest. One day, five or six days before a whole year had passed, the Unborn Lord, together with Balarâma taking care of the calves, entered the forest. In the vicinity of Vraja looking for grass for their calves, they at a distance were spotted by the mother cows that were pasturing on top of Govardhana hill. As soon as they saw them they, urged by their love, forgot about the herd. Despite the difficult path, they broke away from their caretakers and loudly mooing galloped fast [downhill] with their necks raised to their humps, their heads and tails upwards and dripping milk from their udders. The cows united with their calves at the foot of the hill and, despite having calved again, fed them with their flow of milk and anxiously licked their limbs as if they wanted to swallow them. The gopas being frustrated in their efforts to keep them from the difficult and dangerous path, felt greatly ashamed for having gotten angry with them, for when they got there, they found their sons together with the cows and calves. Their minds were steeped in a mood of utter, transcendental love and with that great attraction their anger melted away like snow before the sun. Lifting their boys up in their arms to embrace them, they smelled their heads and experienced the highest pleasure. Thereafter the elderly gopas, overjoyed with the embraces, could only with difficulty tear themselves loose from them and had tears in their eyes upon the memory. 'What kind of miracle is happening here? The divine love [prema] of Me and everyone here in Vraja for the children and for Vâsudeva, the Soul of the Complete Whole, has never been so big! Pondering thus He through His mind's eye saw that all the calves along with their companions were [manifestations of] the Lord of Vaikunthha. [Balarâma said to Krishna:] 'These boys are no [incarnated] masters of enlightenment, nor are these calves great sages. You, oh Supreme Controller, only You are the One who manifests Himself in all the diversity of existence. How can You be everything that exists at the same time? Tell Me, what exactly is Your word to this?' By saying these words Baladeva then with His Lordship arrived at an understanding of the situation [**]. The selfborn one [Brahmâ] returning after such a long time, saw that, even though it was but a moment later to his own notion [see kalpa], one year later the Lord was playing together with His expansions like He did before. [He said to himself:] 'Because the many boys in Gokula together with their calves, fast asleep are situated on the bed of my deluding power, it cannot be so that they today would have risen again. For a long time thus contemplating what the difference between the two would be, he, the selfborn one, by no means could determine who of them were the real ones and who not. And thus even he, the unseen one, was factually bewildered by his own mystic power, he who wanted to mystify Vishnu, the One who Himself being eleveated above all misconception, mystifies the entire universe. As meaningless as the obscurity of a fog is during the night and the light of a glowworm is during the day, a person of a lesser mystic potency will realize nothing but his own destruction when he tries to use this power against a great personality. And even as the selfborn one was looking on, he saw the herders of the calves appearing with the complexion of a rain cloud and in clothes of yellow silk. They had four arms and held a conch, a disc, a club and a lotus in Their hands. They wore helmets, earrings, necklaces and garlands of forest flowers. They were marked with the s'rîvatsa, carried the [Kaustubha] jewel about Their conch-striped necks and had bracelets around Their wrists. They had ornaments at Their feet and bangles on Their ankles. With Their belts around Their waists and Their rings around Their fingers They were most beautiful to behold. From head to toe all Their limbs were covered by strings of fresh, soft tulsî [basil] that had been offered by those [devotees] who are of great merit [see also 10.12: 7-11]. With Their smiles as bright as moonlight and the clear glances of Their reddish eyes, They, being just like [the natural modes of white] goodness and [reddish] passion, were the creators and protectors of the desires of Their devotees [compare 10.3: 20]. The Praiseworthy Primal Being [of Vishnu thus] was by all beings moving and not moving, from the first being [of Brahmâ] down to the smallest clump of grass, worshiped in different ways, with [for instance] dance and song. The glory of the perfections [siddhis, being like the smallest etc. ], the mystic potencies headed by Ajâ [***] and the twenty-four elements of creation headed by the complete of them [the mahat-tattva] were standing around Them [in a personal appearance]. They were worshiped by the time factor [kâla], the individual nature [svabhâva], the reform by purification [samskâra], desire [kâma], fruitive action [karma], the modes [guna] and other powers the glory of whose appearances was defeated by His greatness [see also B.G. 13: 22]. They were embodiments of the complete, one essence full of knowledge, bliss, truth and eternity. In Their glory They were of a greatness beyond the reach of even the seers of philosophy [see also 1.2: 12 and *4]. The selfborn Brahmâ thus saw Them all instantly as expansions of the Supreme Absolute Truth [para-brahman] by whose effulgence this entire creation, moving or not moving, is manifested. By Their radiance being caught in bliss and shaken in all his eleven senses, the selfborn one thereupon fell silent, just like the doll of a child [is nullified] by the presence of a locally worshiped deity. The One Never Born [Krishna] understood that the lord of Irâ [Brahmâ's consort Sarasvatî] thus was mystified. Because by [the presence of] Him who is known by the Vedas [as the Supreme Brahman] everything else is nullified, because that self-manifested [multiple] blissfulness above the material energy superseded Brahmâ's glory and he therefore could not fathom what he was dealing with, the Lord all at once tore away the veil of His yogamâyâ [see also 7.7: 23]. Then, with his external consciousness revived, he like a dead man with difficulty stood up and opened his eyes to behold this [universe] including himself. That moment looking in all directions he saw Vrindâvana situated in front of him with its many trees, a place sustaining and pleasing its inhabitants during all seasons. Man and beast who are inimical by nature, live together like friends in that residence of the Invincible One from which all anger, thirst and all of that has fled away. There the one residing in the beyond [Brahmâ], saw Him, the Absolute Truth Without a Second, the Supreme Unlimited One of Unfathomable Knowledge who had assumed the role of a child in a cowherd family. He saw Him the way He was before: all alone and searching everywhere for His calves and boys with a morsel of food in His hand [*5]. When he saw that, he quickly came down from his carrier [the swan] and fell with his body flat to the ground like a golden rod. With the tips of his four crowns he therewith touched His feet and bowing down performed a bathing ceremony with the pure water of his tears of joy. Over and over thinking about what he previously had seen, he rose and fell for a long time again and again at the feet of Krishna, the greatness present there. **: S'rîla Prabhupâda comments: 'We should be careful to note that although the supreme source is one, the emanations from this source should be separately regarded as inferior and superior [meaning unconscious and conscious - ed.]. The difference between the Mâyâvâda and Vaishnava philosophies is that the Vaishnava philosophy recognizes this fact. S'rî Caitanya Mahâprabhu's philosophy, therefore, is called acintya-bhedâbheda - simultaneous oneness and difference.' [see also the dual position taken by Krishna in the Bhagavad Gîtâ 7: 3-6]. ***: Ajah means unborn but Ajâ, the she-goat, is a nickname of His deluding power by Mâyâ-devî or Durgâ. According to Prabhupâda [the paramparâ] namely the word ajâ means mâyâ, or mystic power: everything mysterious is in full existence in Vishnu. Ajâ Taulvali is, according the Cologne lexicon, the name of a Muni who lived on the milk of a she-goat [an ajâ]. The term aja [the he-goat] itself refers to the leader of the flock, the driver, mover, instigator, and is used for indicating Indra, Rudra, one of the Maruts, Agni, the sun, Brahmâ, Vishnu and S'iva. 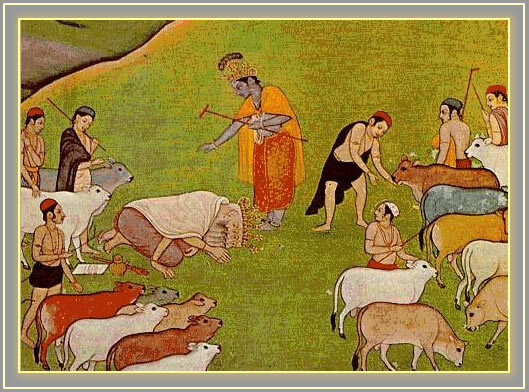 The first painting is titled: 'Krishna Shares Food with Balarâma and the Cowherds during the Rainy Season'. Page from a series of the Bhagavata Purana (Story of the Lord Vishnu). 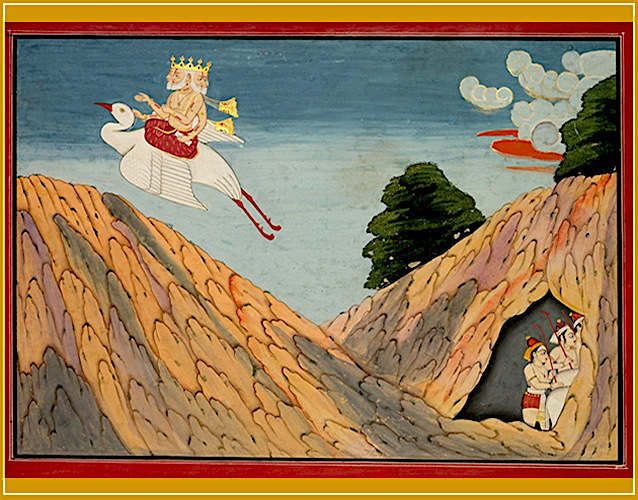 The second painting depicts Lord Brahmâ hiding the gopas in a cave. Source. The third picture of Brahmâ returning the boys and prostrating before Krishna is a Pahari painting. Source: Gallery of Pahari Paintings.